Description: Bold drama, unmatched grandeur and luxurious sophistication are defined by this magnificent statement piece for large residential, hospitality and commercial spaces. 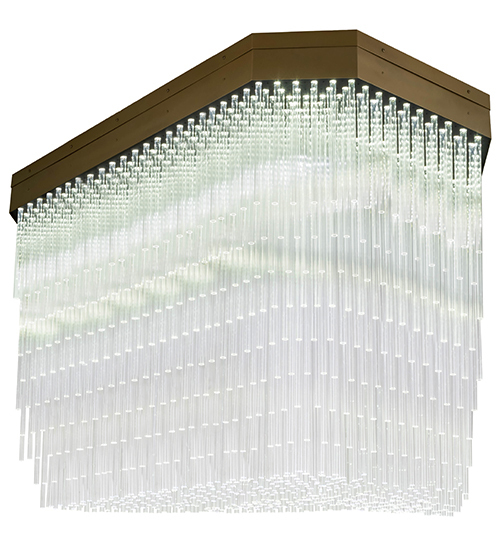 The Havasu Flushmount is a refined ceiling fixture designed and engineered with over 700 Crystal Idalight tubes. Like fine crystal, clean prismatic lines evoke a stunning, dimensional look and illuminated brilliantly with Integral energy efficient LEDs. The hardware is featured in a Buttered Brass finish. Custom crafted by highly skilled artisans in the USA, this fixture is offered in custom sizes, styles and finishes, as well as dimmable energy efficient lamping options. The 84-inch long ceiling fixture is UL and cUL listed for dry and damp locations.